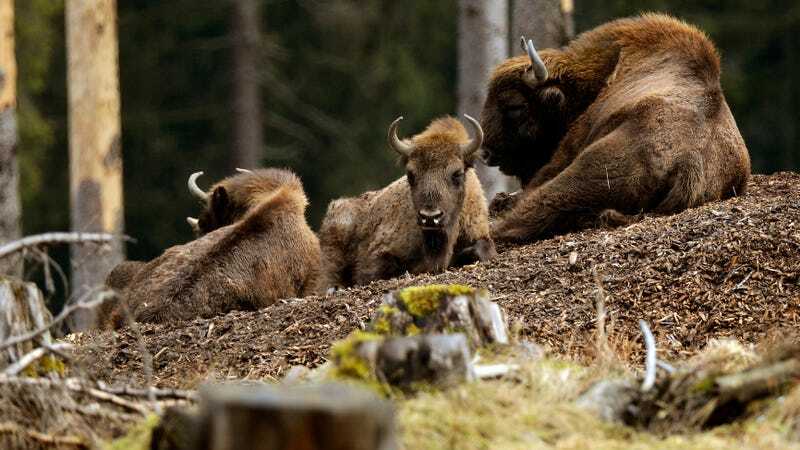 The World Wildlife Fund said on Friday it will be pursuing charges against a local official who, upon receiving a report of the first sighting of a wild bison in Germany in over 250 years, promptly ordered hunters to shoot the animal dead. According to the Local, police say a man spotted the bison near the river Oder in the town of Lebus on September 13th before reporting what he had seen to the public order office in Brandenburg. The head of that office determined the bison was a threat to the local population and had two local hunters shoot it the next day. The animal likely wandered from Poland’s Ujście Warty National Park, which sits on the border with Germany, Polish officials told the paper. It is not known to be dangerous to humans. Just last year, the Dutch government reintroduced 11 of the bison to state forests in the province of Noord-Brabant in hopes of establishing a breeding stock to repopulate the species’ previous range in western Europe. It had previously introduced one other population to the Kraansvlak nature reserve in the province of Noord-Holland in 2007, per National Geographic. Rewilding Europe managing director Frans Schepers told the magazine the species was ideal for reintroduction as it could speed the recovery of forests and plains. Something that, naturally, requires not shooting them on sight.